In my research on Jay Cooke, I read that Cooke had a private telegraph line. When Matthew and I first surveyed the collection, we discovered several folders full of ticker tapes and queried one another about best practice for housing them. It was helpful to have this piece of information to explain the quantity of telegrams in the Cooke papers. They are rather fun to read, and add a bit of behind-the-scenes perspective on Cooke’s voluminous formal correspondence. While I had hoped to find some evidence of these telegrams in the collection, correspondence of any form from September 1873 is extremely limited. What I did find, however, were telegrams reporting other types of news–mostly business related (requests for meetings, buying and selling of securities, informal reports from business partners, and the like)–and some personal correspondence from friends. J.R. Young informs Cooke that Harper’s Weekly had attacked him, and asks for “facts for reply”. 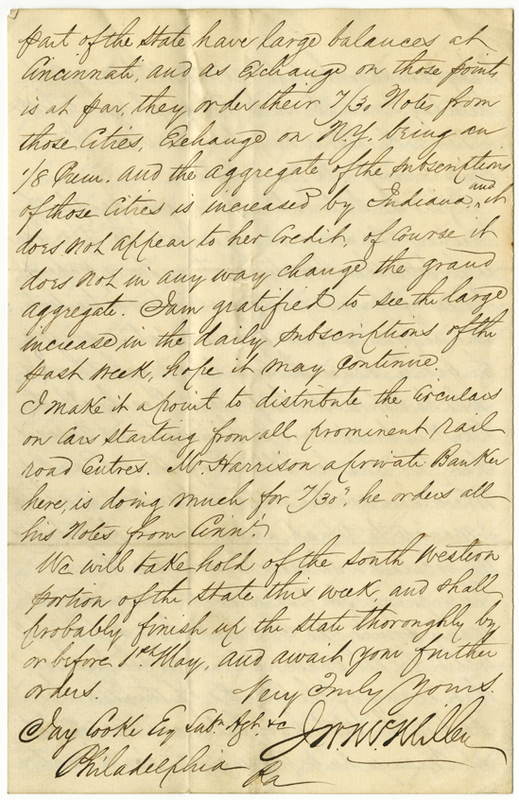 These brief missives are a few examples of the correspondence in the Cooke papers. 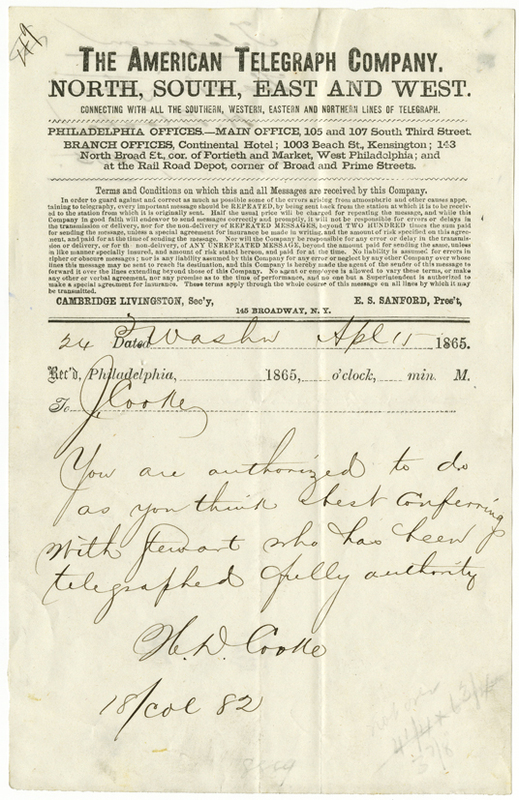 The telegrams offer a glimpse into the private negotiations that moved the market and helped to build Cooke’s empire and reputation. 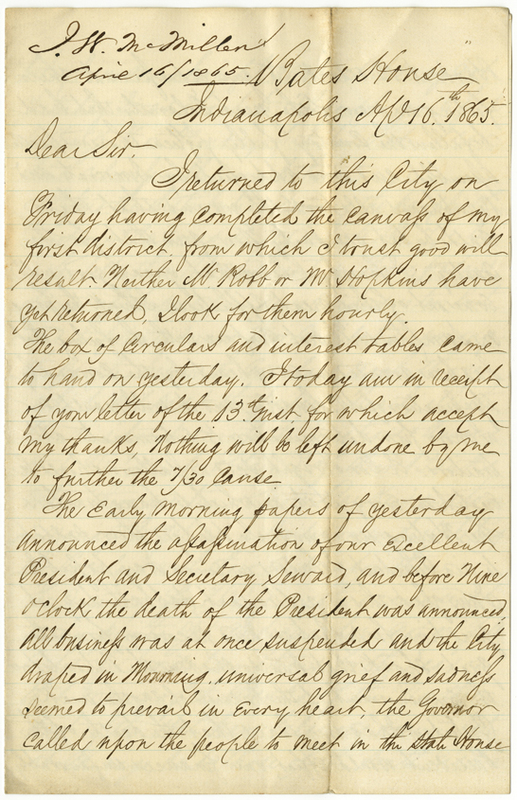 Jay Cooke & Co.’s fall was a great shock to many, and in the one thin folder of letters from September 1873, friends and strangers alike offer expressions of sympathy for Cooke’s “misfortune”, but confess great confidence in his ability to recover. One author declares that “every man, woman and child” in the Union owes Cooke a debt of gratitude for all that he did to support the war. 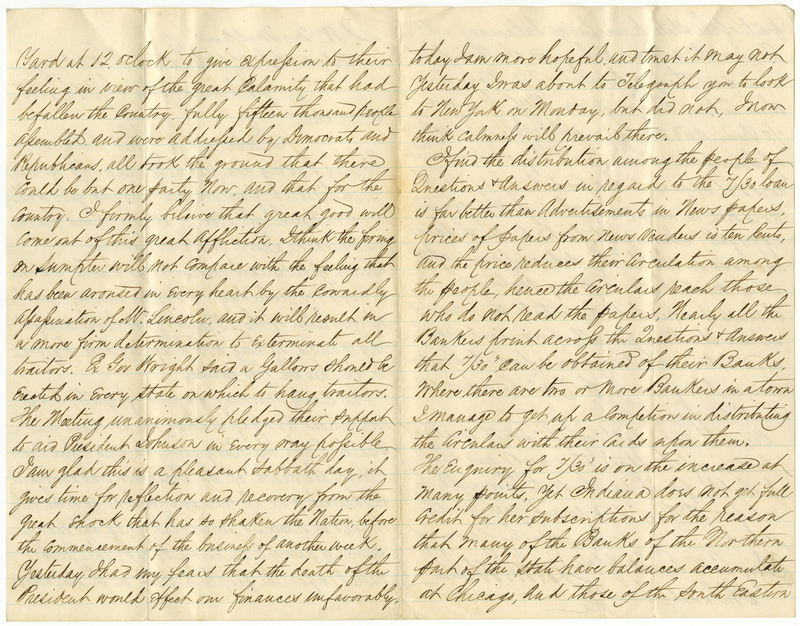 These letters are moving and reveal the esteem with which Cooke was held in the public eye. Cooke was a larger-than-life figure, shaping the financial world for many years, and I imagine that the 25-plus years of rich correspondence in this collection will reveal much about this man and his fiscal decision-making processes. I look forward to announcing the new finding aid for this collection by the end of May. Today marks the anniversary of the death of Abraham Lincoln, who was assassinated in 1865 by John Wilkes Booth. 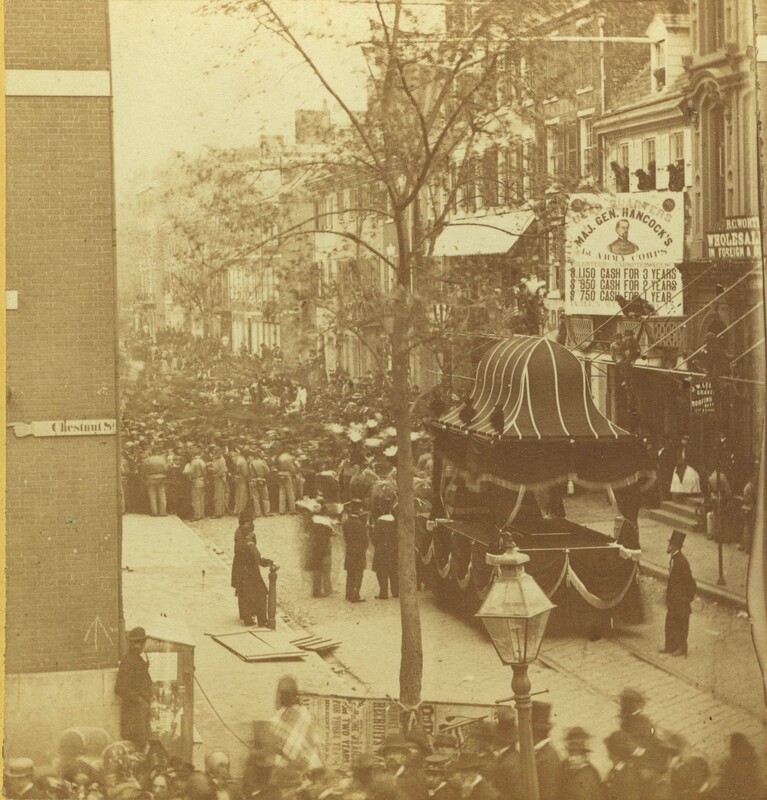 While there is little need to recount the events of April 14-15, 1865, when Lincoln and members of his cabinet were mortally wounded, the echoes of mourning in correspondence from the days following are worthy of a look. 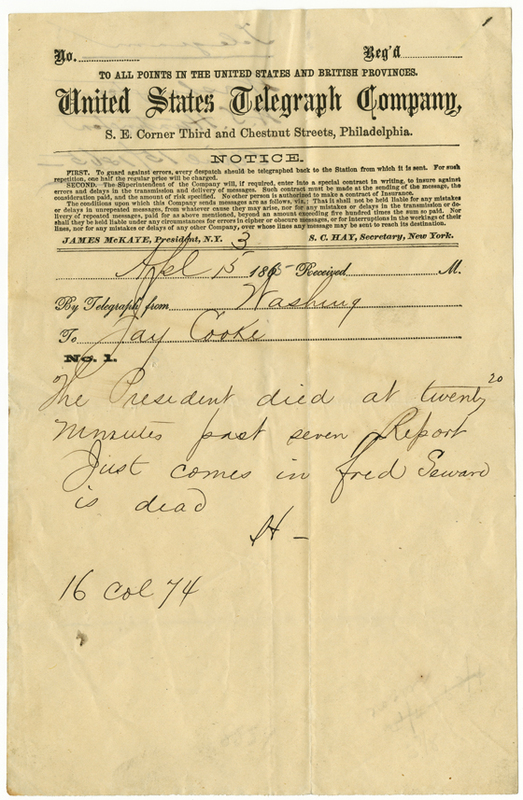 I have been working on the Jay Cooke papers (collection 148) this month, and within his correspondence, there is a great deal of documentation about the assassination of Lincoln because of Cooke’s prominent connections within the federal government. Cooke was called the “financier of the Civil War” because of his efforts to raise money for the Union war effort by selling government bonds. Cooke was friends with Salmon P. Chase, the secretary of the Treasury, and was entrusted with many major stabilizing efforts during Lincoln’s presidency and immediately following his death. These two telegrams offer a glimpse into Cooke’s importance in stabilizing the financial markets, which he did with his own money after Lincoln’s death was confirmed and financial panic was beginning to grip the nation. The second telegram is authorizing Cooke to buy securities to quell the beginnings of a crash. Cooke’s brother Henry ran Jay Cooke & Co.’s Washington business, and was also a major player in the political arena, making their operations successful into the 1870s. 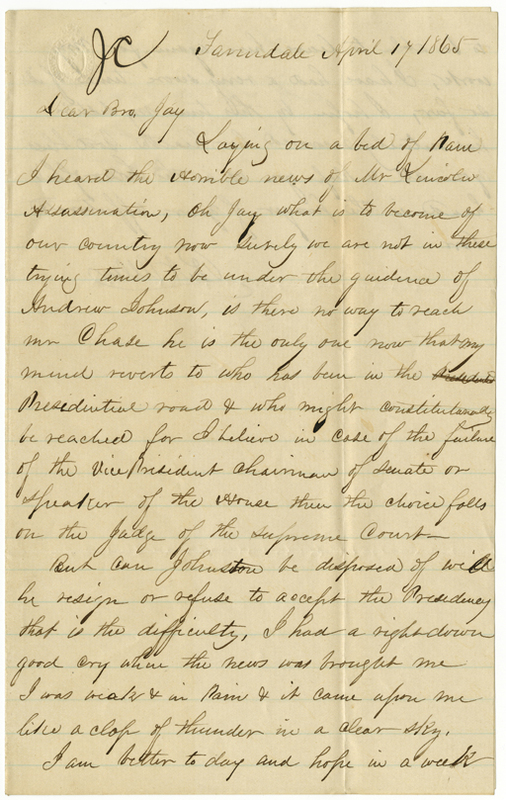 There is much more correspondence in the Cooke papers, including many letters from Salmon P. Chase and other prominent public figures. These papers are extremely rich in their coverage of the Civil War era, offering behind-the-scenes views of major negotiations, financial discussions of national importance, and windows into the social and intellectual lives of the men who surrounded Cooke. 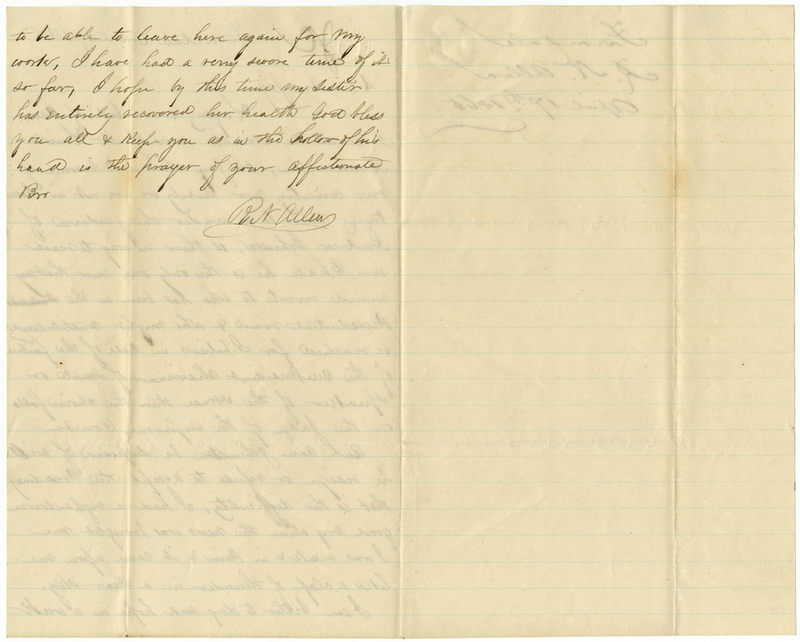 The Jay Cooke papers are currently being processed, and will be unavailable to researchers until mid-May 2010. At that point, a finding aid will be available online for these materials for the first time.